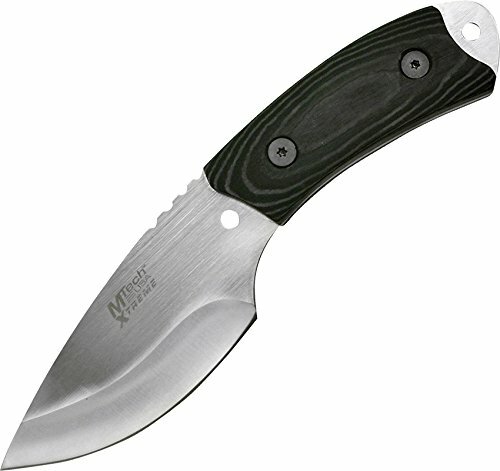 Save 1% on the MTECH USA XTREME MX-8035 Fixed Blade Tactical Knife, Black Micarta Handle, 7-Inch Overall by MTECH USA XTREME at Freedom from Government. MPN: MX-8035-MC. Hurry! Limited time offer. Offer valid only while supplies last. The MTech USA Xtreme Fixed Blade Tactical Knife (model MX-8035) features a curved blade and black micarta handle, with a 7-inch overall length. The MTech USA Xtreme Fixed Blade Tactical Knife (model MX-8035) features a curved blade and black micarta handle, with a 7-inch overall length. Offering full tang construction, it comes extremely sharp so make sure you use caution when removing it from the sheath. This fixed blade neck/boot knife features a 3.75-inch, 5mm thick, 440 stainless steel, and curved hollow ground blade with a brushed finish. Grade 440 stainless steel contains more carbon, giving it excellent hardness and edge retention. The handle features black and gray micarta scales, which not only look great but also really offer a solid grip and hold up under repeated usage. It comes complete with a black molded Kydex neck/boot sheath, which features a boot clip and lanyard holes (neck cord included) and has a very tight friction fit. MTech USA Xtreme offers a variety of both tactical fixed blade and folding knives that are made with thicker and higher grade materials such as 440A and 440C stainless steel blades. If you have any questions about this product by MTECH USA XTREME, contact us by completing and submitting the form below. If you are looking for a specif part number, please include it with your message.